Our body requires calcium every day for countless functions. If we do not get sufficient calcium from our food, our body removes calcium from our bones. Over time, this contributes to osteoporosis. Getting the recommended daily intake of calcium can minimize the risk or slow the advancement of osteoporosis. In order for calcium to be effective, it must be absorbed by the body and utilized by the cells. Many calcium supplements are ineffective because they do not include the essential nutrients needed for proper absorption. In particular, calcium needs vitamin D and an acidic environment in the stomach in order to be absorbed. Lifestyles Calcium Formula provides your body with a highly absorbable form of calcium, vitamin D and magnesium, to help contribute to the normal muscle function and the maintenance of normal bones and teeth. Our unique formula includes betaine hydrochloride (acid producing compound) as well as the necessary nutrients to ensure maximum absorption. Lifestyles Calcium Formula also contains vitamin C, zinc, copper, silicon, horse tail, coix seed and betaine hydrochloride. 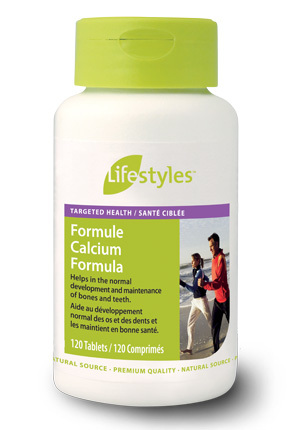 Two tablets of Lifestyles Calcium Formula will provide you with a total of 500 mg of calcium daily. Get your daily calcium intake with Lifestyles Calcium Formula!